A Navitas assuming a human form. Navitas is Latin for Energy. The Navitas are the oldest known race in the Galaxy and have somehow evolved into “bio-organic energy”. They have mass, a tralucent biological flesh that encompasses free form energy. Navitas have the ability shape themselves at the will of the individual, but their natural form stems from their historical origins; a bipedal shape akin to the human form. Not only do they exert control over their own atomic substance, but can affect and manipulate their immediate surroundings at the sub atomic level. Navitas can use electricity and magnetism to effect and manipulate objects around them. 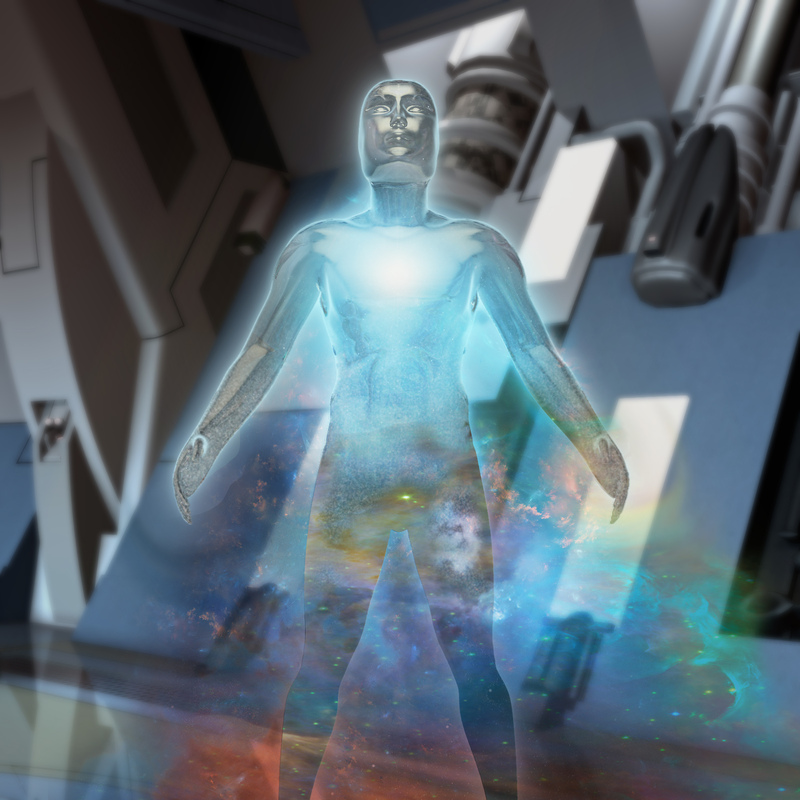 The ability to alter atomic particles allows them to create fields and bonds, giving their abilities the “mystical” appearance of telekinesis, levitation, near invisibility, and polymorphism. Navitas multiply through a chemical process. The “male and female” of the species go into a state of hibernation, together, for thirty earth days. During this time they are chemically bonded and unable to function normally. When the process is complete, they separate, and the infant is released. An infant Navitas resembles human mythological “willow wisp”. At the early stages of development, it is ambulatory via the “levitation” ability. It needs only the radiation of sunlight to nourish and grow. When interacting with another race, they may stay in their natural form or take the form of that race. Though they simulate the form, and features of another race, they are not simulacrum… they do not have the texture and color of skin or hair, scales or crystals, or wear clothing. The exception to that is a Navitas soldier, who does have technology based weapons and armor to compliment their natural abilities. Navitas emit a glow that has been seen varying from pure white, to blue-white, to yellow, to orange. The color of the glow is determined by a fairly complex derivative of culture, social status, and age. The color of the glow shifts with a change to one or more of those conditions. Very old Navitas consistently emit a russet hue. Navitas think and react and communicate with each other at the speed of light. This makes them incredibly fast, and the most intelligent, analytically capable, species of the four (or five if you consider the Core to be a species) who have survived the second Galactic Age. Two Navitas can have a conversation with each other longer than War and Peace in a few microseconds. They are fairly impervious to physical damage, but energy based weapons as well as high explosives can damage their flesh and disperse their energy to the point of death. Though they need sunlight to survive, they have adapted suits and their vessels to radiate the “food” they need for environments that do not provide them naturally. Navitas have developed and follow a form of true democracy. They elect all their leaders, political, military, and science, in an “as needed” voting process that can be accomplished in minutes for even the largest elections.